The route today was pretty convoluted. Ride a mile, turn left. Ride a mile, turn right! It was like that all day until we reached Painesville where we stopped in the middle of town for lunch on the sidewalk with the bikes. An older couple stopped and asked us about our trip. 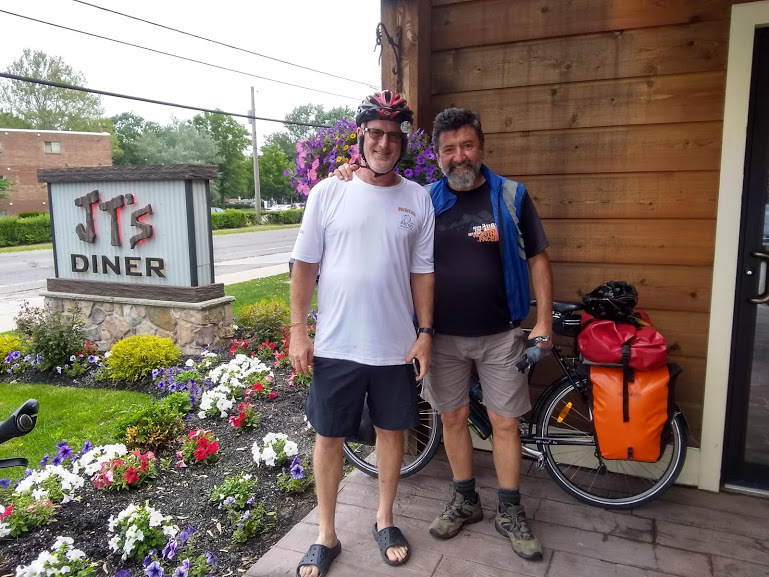 They had also completed the “Trans” (a coast to coast crossing of America) as well as many other routes around the country. 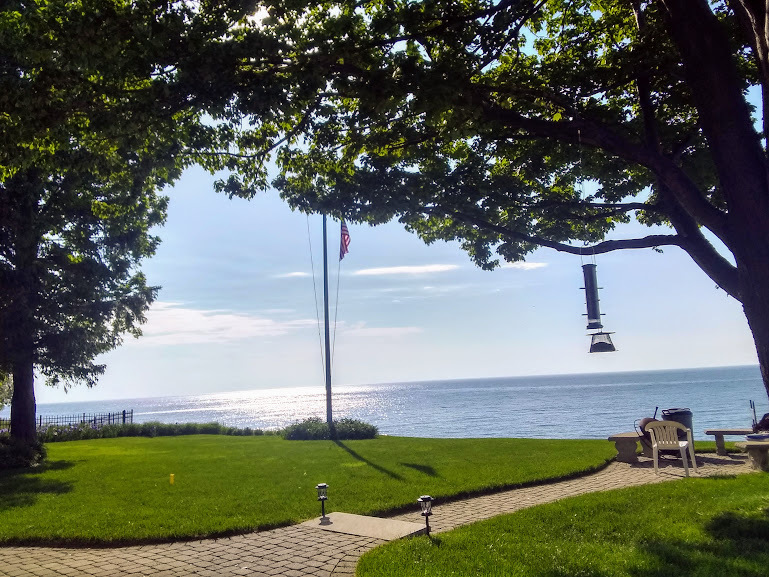 We were staying with a Warmshowers host again in Mentor On The Lake, some 15 or 20 kilometres up the road on the lakeshore. Sharyn had contacted them and let them know where we were and we set out on our way. About 6kms from their place, Bill, our host found us on his recumbent bike. He was going for his daily ride and would see us at his place. We stopped and bought some beers and snacks and arrived at his place before him. His house is right on the lake with an expansive lawn running right down to the lake’s edge. The house was amazing, but Bill seemed keen for us to camp on the lawn. As rain was predicted overnight we subtly angled for a bed and got our way. Bill is a keen cyclist and his garage is filled with 18 bikes of all designs. There was barely room to put our own in for the night. Later on, his wife Julie came home and cooked us dinner, which we gratefully appreciated. 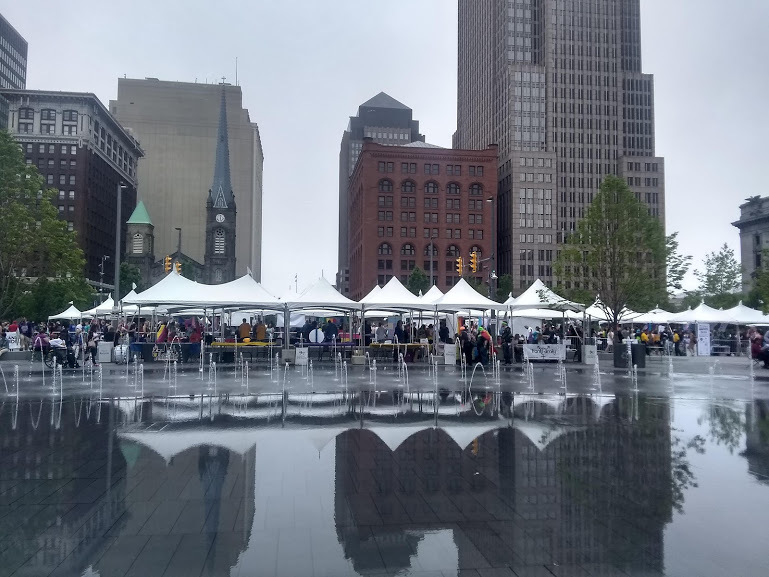 The ride today was a very urbanised one as we had arrived in the greater Cleveland area. Our route stuck to the lakeside, taking us through the suburbs on the smaller roads where possible. 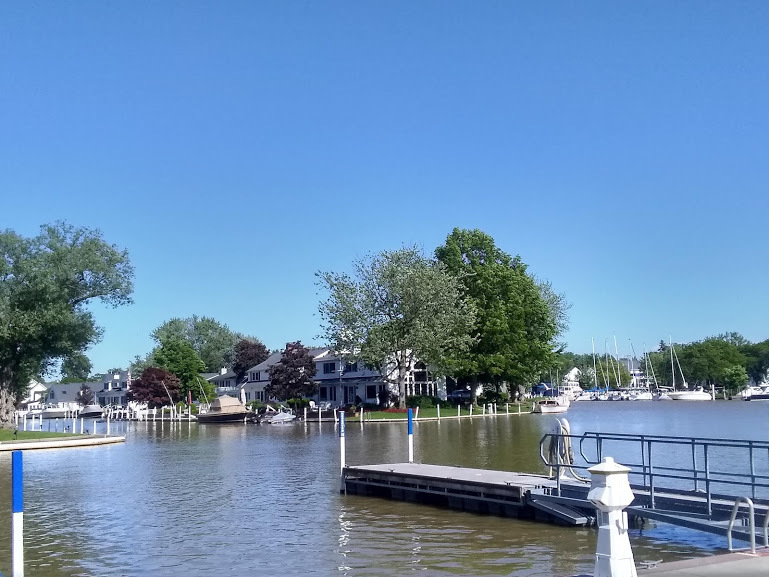 It eventually led us to a bike trail that passes through a park and winds through a VERY expensive suburb full of leafy streets and waterfront mansions until you arrive in the downtown area. Cycling into the Greater Cleveland area. Some nice places around here! 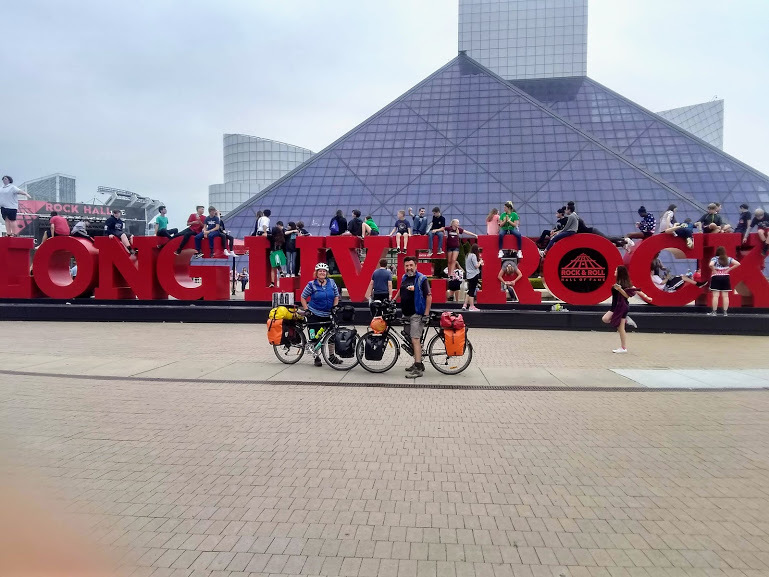 The route took us right past the Rock’n’Roll Hall of Fame, which I intended to visit while here, and right into the heart of the city and over the Detroit Avenue Bridge down to our Airbnb in Wakefield in the historic part of town. We had booked for 3 nights so we could have a look around the city as well as have a break for a while. We settled into our room on the second floor of a refurbished, old period house in a sleepy, tree-lined neighbourhood. In the evening, hungry, we strolled up to the XYZ bar on Detroit Avenue for dinner. It’s a trendy place with a hipster crowd and a pretty good menu. It also had a good selection of craft beers which kept us happy. It’s also in the heart of the arts district with plenty of galleries and theatres surrounding it. The next day we took a train back into the city. 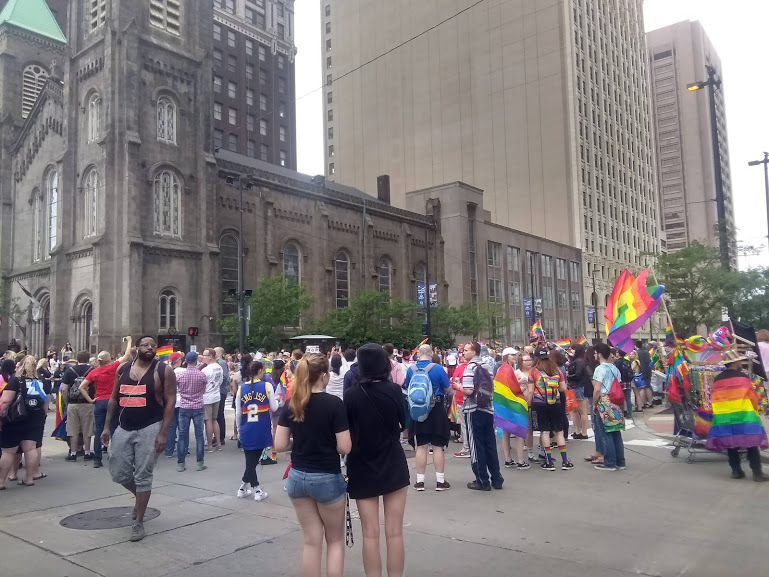 We walked out of the cavernous train station building straight into the Cleveland Pride March. Outrageous costumes and pink bellied the dull coloured buildings and steel grey skies. Most of the participants were clearly not affected by the icy winds sifting through the tall city buildings. We, on the other hand, were well covered up and feeling the cold. There was lots of razzle-dazzle, bands, bbqs and beer. Even the police were represented at the march and hammed it up a bit for the crowds – which they loved. I left Shazz to look around town and get some pictures, while I headed back down to the Rock’n’Roll Hall of Fame. I’d allowed myself 3 hours to look through the extensive collection of rock music memorabilia, which I knew wouldn’t be enough, and, I was right! There’s simply too much to see in just one visit. Everything you could possibly want to know about Rock’n’Roll is here. From the early days of Delta Blues to Elvis, Country-Rock, The Beatles and Stones, to Heavy Metal and Glam Rock. All the inductees were represented and you could cast your vote for who you wanted to be inducted this year. I’d definitely recommend a visit. I met up with Shazz later and we headed to Jack’s Casino next to the train station for a while. No luck there though. 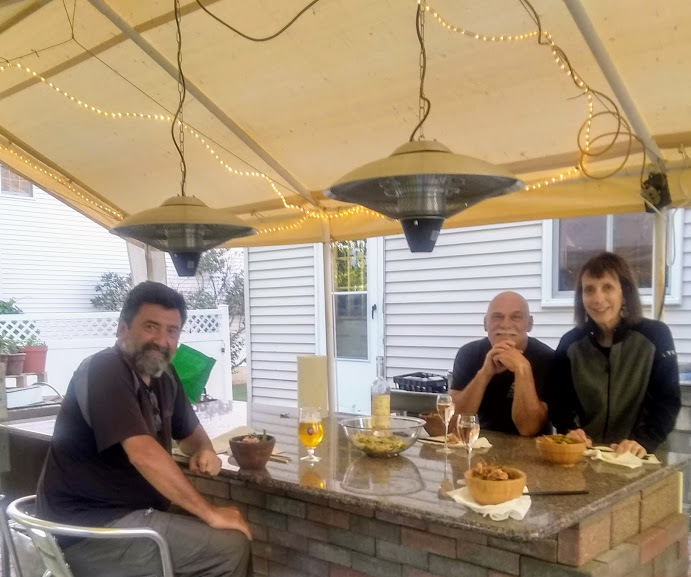 Back home, we had dinner with our host, his son, and his girlfriend. It was an interesting night. The next day, I found the local bike shop and bought some more chamois cream, expensive but essential! 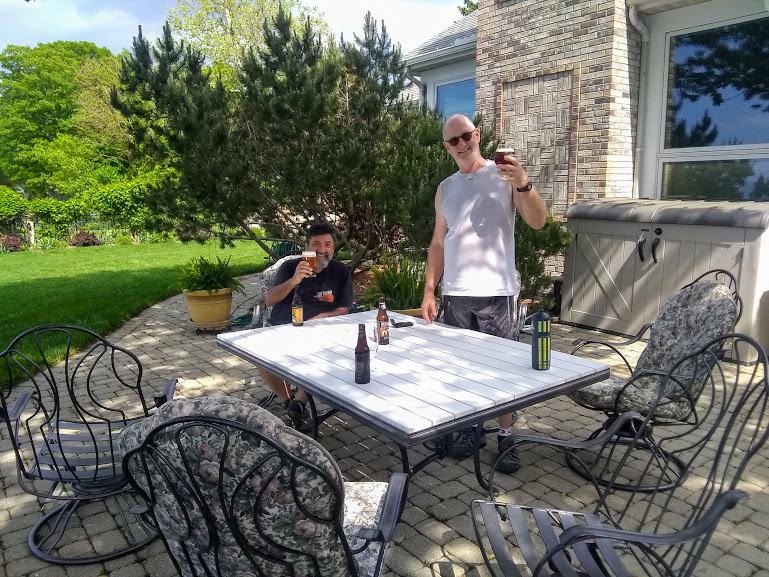 later on, we walked over to Lorain Avenue to visit The Platform Brewing Company, a small outfit who cater for small-time brewers who can’t afford their own setups. This provides the small guys with a place to showcase their beers, and, if it’s popular, to remain on a regular tap. It’s a very casual atmosphere and very popular with people from near and far. Certainly worth visit. 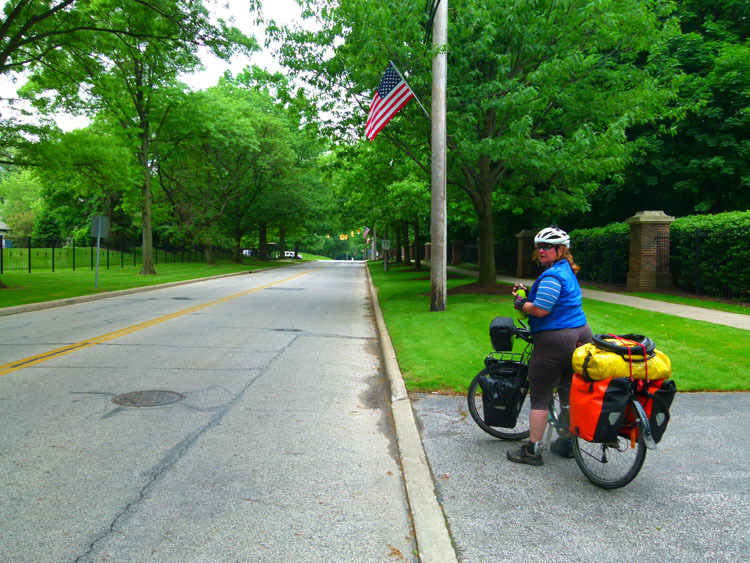 It took us some time to cycle out of Cleveland’s sprawling suburbs. Our route via Lake Road seemed to go on and on. Road works sent us off route for a while, but we managed to find our way again using Google Maps (our handiest resource). The ride along the lake wasn’t exactly exhilarating, with a house on both sides of the road, views of the lake were intermittent. Like most places we’ve seen so far, including Canada, most of the houses have no boundary fences. This gives the impression that the blocks are larger than they actually are and allows for an uninterrupted lawn for blocks at a time. 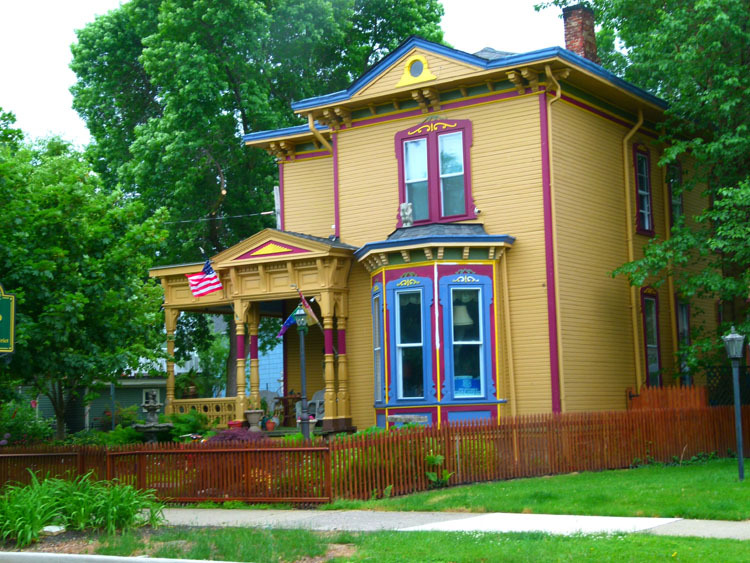 It’s much easier on the eye than ugly, unmaintained fences and gives the impression of a close-knit community. As you can imagine though, with the warm weather upon us, nearly every place we see has a ride-on mower making its way around the block. This racket has quickly become the sound of North America for us! We stayed with another Warmshowers in Vermilion. Our hosts, Sam and Susan were fantastic. Sam even rode out about 12kms to greet us. He quickly found out just how slowly we ride, and we advised him to ride ahead, we’d find his place no worries. Sam is retired now, he worked for 20yrs as the Orthopaedic Surgeon for the Cleveland Indians baseball team. 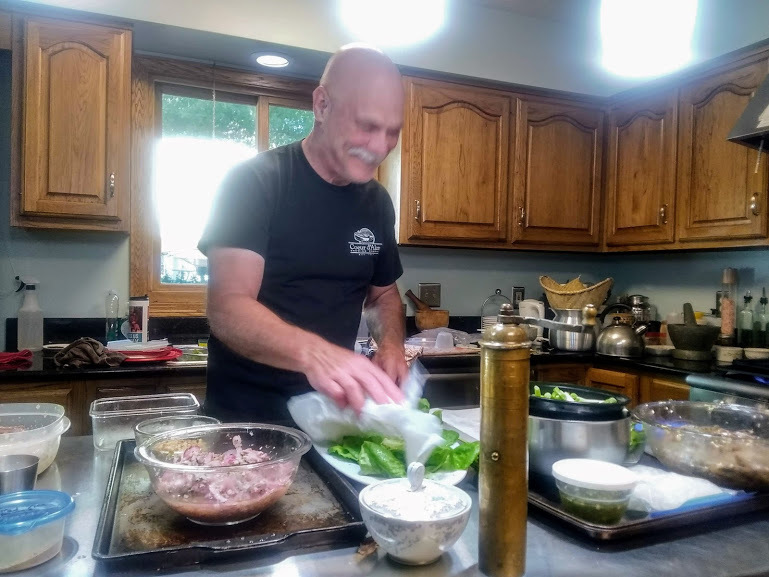 But, being from England originally, he’s more into his soccer and is a rampant Manchester City fan as well as something of a part-time chef. Sam preparing a 2-course Vietnamese dinner for us – how good is that??!! That afternoon, he took Shazz and I into town for a look around. We visited the old lighthouse and saw where he originally lived when he first came here. Keen for a beer though, we headed to the main street to the Wine Vault, a trendy little restaurant not only specialising in wine, but with a good selection of craft beers on tap. Back home, Sam had prepared a 2-course Vietnamese dinner for us! He had read that we live in Saigon and was keen to try out a couple of recipes. It was pretty good and very kind of him to go to so much trouble for us. We were very impressed and more than a little humbled. Later, we met his wife, Susan. She’s a school teacher and something of an athlete. 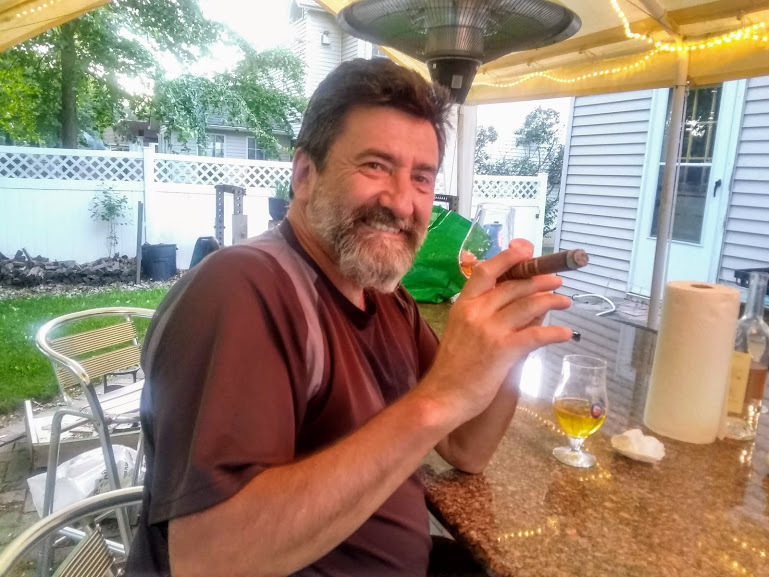 We finished up on the back patio smoking cigars and sipping single malt whiskey – what a bloke! Hey! If you’re going to enjoy single malt whiskey, then you might as well go the whole hog! From Vermilion we made our way along to Huron, our final place on the lake before heading south then west. Here we stopped for coffee at a small bakery on the main intersection. It was pretty full with friendly, older locals all enjoying their ritual coffees and a doughnut. As usual, the coffee is refillable, drink as much as you like. We had one of the younger local guys come and sit with us for a chat, he was very interested in our trip and he gave us some directions for getting out of town easily. We bade him farewell and went to pay our bill. Too late! our new friend had already paid it for us! Once again, the generosity of strangers had blown us away. From Huron, we dropped down south for a while towards Avery and the Ohio Turnpike (Interstate Hwy 80). Passing under the Interstate we headed west again on a long, gun-barrel straight country road. We had officially entered the Corn Belt. Corn filled the vista for as far as the eye could see, only broken up occasionally with soybeans or the odd fallow field. From one almost endless country road we turned onto another and into a pretty solid headwind. For the last 20kms, we pushed down to the small community of Clyde, where we had booked a room at the rather grand-sounding, perfectly adequate, but less than amazing Plaza Hotel for the night. Fortunately, after crossing 4 lanes of busy traffic under a now darkening steel grey sky, we turned onto a rail trail that led into town. The light shower eased up just as we squeezed ourselves and the bikes into the room and rested for a while before heading out for something to eat. To our surprise, there was almost nothing except the service station on the main highway and that had only the usual unappealing fare. So, we set off to find the downtown area, which turned out to be just as lacking in restaurants and cafes as the main road. 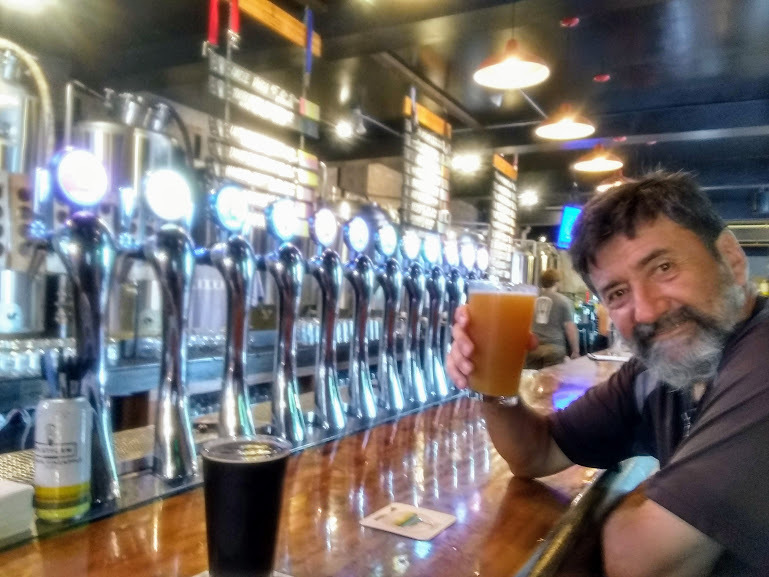 Fortunately, after quite a walk and a bit of luck, we stumbled across The Alley Taproom, a very inconspicuous, well-hidden locals bar with a very good selection of craft beers, mainly in bottles. We quickly made friends with the barmaid and a couple of the locals who frequent the place. It turned out the old fella we were sitting next to was celebrating his birthday (and had been for some time apparently!). So, we bought him his next drink and instantly endeared ourselves to everyone in the bar. It seems he is something of a character and well loved. Unfortunately, the bar had no food, none that we needed to sustain ourselves for our ride tomorrow anyway! So, we settled for the service station menu and made our way back to the room. It looked like we were the only ones staying at the motel and meant we’d at least have a quiet night’s sleep.